This extra large coffee organizer presentation works great for busy, high volume coffee service areas. 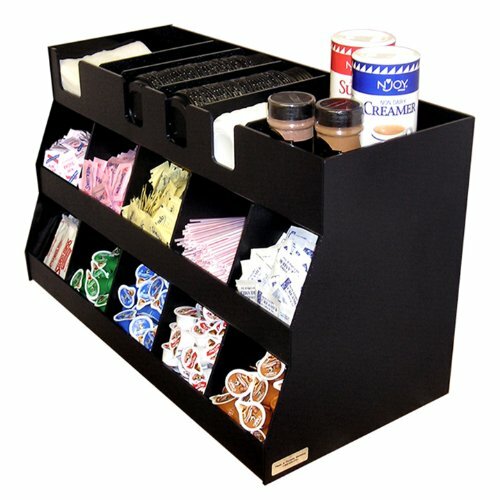 Top shelf holds your coffee lids, canisters and more! Easy to stay organized and neat and not run out during the day. 10 large permanent compartments hold all your coffee fix'ins from K-Cups, creamer cups, sugars & stirrers. Made of extra thick, slightly textured black ABS. Virtually non-breakable, easy to clean with mild soap and water. Do Double check your space~! !This is a Large Unit 27" Wide x 12 3/4" Deep x 16" High (plus what your put on top!) To VIEW ALL Our Products...just click on..."Sold by...PPM Sales". If you have any questions about this product by Plastic & Products Marketing PPM, contact us by completing and submitting the form below. If you are looking for a specif part number, please include it with your message.